Does the tendency for average profit rates to fall exist? Even Marxist Pages (May 2009) makes the mistake of many "communist" or "Leninists" who, ignoring or underestimating developments and countertendencies to the fall in the rate of profit, do not see anything in the periodic crises of capitalism other than the effects of a mode of production which is said to proceed blindly, careering continuously between overproduction and economic crises of adjustment. Therefore, they see no absolute and irreversible trend towards the "final crisis". 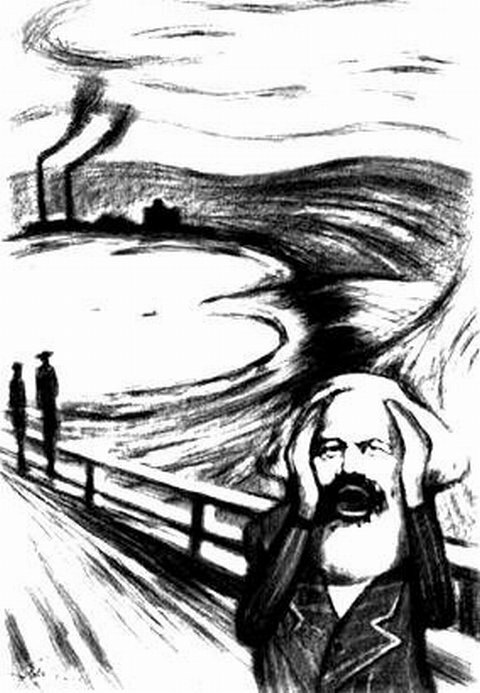 A conclusion that, indeed, none of us has ever dreamed of putting forward, perhaps hoping that capitalism will collapse by itself, following an 'objectivist conception "- writes Marxist Pages - which does not take into account the subjective intervention of Communists. We repeat: If anybody has ever rejected, wherever it tends to rear its head, an absolute perspective, deterministic (the crisis of no return, inevitable end of capitalism, etc..), it is our party. We stand against the illusion, indeed, that capitalism will one day surrender its power on a silver platter. Marxist Pages ignores any hint of what was the beginning of the crisis (the seventies) with which - with varying stages - capitalism is struggling. So they have nothing to add to the "Leninists" of Lotta Comunista, which from 1970 until today have always rejected "scientific" analysis conducted on the basis of a thorough explanation of the law (of the tendency for profit rates to decline)- considered by Marx the most important of capitalism, and the cause of its crisis of accumulation from one cycle to another. We observe how, on data processed by the Bureau of Economic Analysis between 1929 and 2008, they consider the totality of profit interest and income (“net operating surplus" of business) without drawing attention to the fact of the presence in those statistics, of income due to parasitic and speculative sources swelling from year to year compared to a decrease in industrial profit. In his recent book ( "Finance takes all", Il Mulino), R. Dore analyzes the financial activities of the last decades and highlights the high level of profitability achieved. Well, scrolling through the historical stages, it appears that until 1950 while the share of the profits of financial firms in the total revenue was estimated to average 9.5% year on year, it reached as much as 45% in 2002 and then stabilized at this percentage. In the period 1929 to 1933 interest and income had increased while the profits of the companies collapsed, in 1968 the "Gross operating margins" fall below the data of 1929, reaching a minimum profit in 1980. Then follow a series of oscillations with some peak in 1997 and 2006, precisely when the decline in wages allows a breathing space for restoring profits. The analysis of Marxist Pages then highlights an increase of employees as part of the total population as compared to 60 or 40 years ago, and with a smaller portion of income. This belies the idea of an "advanced state" of the fall in the rate of profit, since - according to Marxist Pages - it is not at all true that there has been occurring for decades a significant increase in constant capital relative to living labour. So much so that profits are still high, both in absolute terms and relative to the product and capital. A harsh blow to the Marxist theory (but we promise to examine this "apparent contradiction" ...) because the relationship between the base of constant capital and living labour would be - again, Marxist Pages - almost stable in 1929 and slightly more so in 2007. However they make no distinction between employees productive of surplus value, down sharply, and the numbers of unproductive workers, up sharply... There was even a growth in labour power (increase of productivity per unit of labour) which would have further reduced the ratio of fixed assets and product. In short, capitalism thrives, and if anything, the crisis was initiated by an excess of consumption, perhaps by a "surplus" in relation to solvent demand. Nothing more than - we read - "a cyclical phenomenon in the life of capital; normal 'seasons' of recovery, expansion, boom, crisis and stagnation, with signs of restructuring, consolidation of capital and production across sectors and regions," and recurring every decade. Everything is driven by the unbalanced structure of capitalism, or rather the imbalances that are created during the restructuring, in the structural cyclical changes. At least two things should be briefly clarified. The overproduction of capital and goods, is a phenomenal form of capitalist crisis. The cause of over accumulation of capital - because that is what it is - is due to the law of the downward trend in the rate of profit. A fall which is driven by the progressive development of social productivity of labour, a development that leads to a higher organic composition of capital (variable capital less than the constant). Deepening understanding of this inescapable contradiction that gnaws at the capitalist system, a system only interested in profit maximization, is the task for those who - through the critique of political economy, and following the theoretical analysis of Marx - have the goal of developing a strategy and a tactic that can guarantee the revolutionary goals of communism to the struggle of the proletarian. Therefore, we refer readers to study materials and critical analysis produced by us (see also the last essay on Prometheus No. 1, VII series).